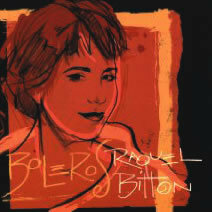 Raquel Bitton and the bolero share similar heritages, mixing French and Spanish influences to create a fiery romanticism of soaring intensity. And Bitton, who suggests a spicier Edith Piaf (and, indeed, has earned substantial success investigating the Piaf songbook), seems an ideal choice for exploring, in French and Spanish, the work of the greatest Cuban, Mexican and Spanish bolero composers of the 20th century. Of these dozen classics, only one, Consuelo Velàzquez’s scorching “Besame Mucho,” will likely be familiar. But there is a spectrum of quixotic delights to be discovered here, ranging from the light shimmer of “Guitare d’amour” and swinging, horn-fueled bounce of “J’attendrai” to the august passion of “Aranjuez, mon amour” and soul-deep fervor of “Adoro.” Consider it a first-class ticket to alluringly piquant musical vistas.